LANSING — Environmental experts are urging Michigan property owners to get rid of lakefront lawns and stone breakwalls in favor of a new approach to landscaping. Lakescaping is a way to control shoreline erosion by moving inland lakes to a more natural state. According to the Michigan Department of Environmental Quality, replacing traditional sod lakefronts with native plants can also combat invasive species, improve wildlife habitats and save property owners money on upkeep. “When dealing with lakes, it’s important to have as minimal an impact as possible,” said John Skubinna of the Department of Environmental Quality’s water resources division. Erosion is chief among these problems, Skubinna said. Constructed erosion deterrents like breakwalls and heaps of rock called riprap are effective at preventing erosion but can also deflect waves elsewhere. “You can build a breakwall but your neighbor better have one too,” said Jane Herbert, a senior water resource educator at the Kalamazoo County Michigan State University Extension. Skubinna said shoreline plants do a better job of absorbing and dissipating energy from waves and rain. Another threat to a lake’s health is runoff. Pesticides and fertilizers used by homeowners to maintain their lawns and gardens eventually wind up in lakes, where they can do severe damage to the ecosystem. Skubinna said a buffer zone of long-rooted native plants keeps tainted sediment out of the water and dangerous chemicals out of lakes. Lakescaping can also help combat the spread of invasive and nuisance species. Lakefront property owners could also be relieved of a more visible nuisance. 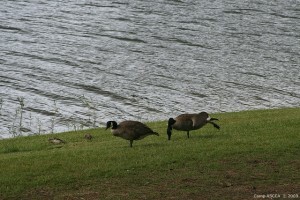 Canada geese, which can damage lawns, avoid tall grasses and thick vegetation. While natural vegetation makes a stout barrier against invaders, it can give a leg up to welcome species. For example, frogs and turtles looking for a change of scenery can’t climb walls of rock and riprap but a natural, gradual slope makes land more accessible for them. Not only does lakescaping decrease a lawn’s impact on the environment, it can also help decrease a lawn’s impact on a property owner’s wallet. According to the Environmental Protection Agency, installing turfgrass costs more than $12,000 per acre while restoring a lakeshore with native plants costs only $2,500 per acre. After two to three years of growth, natural lakeshores require virtually no maintenance. Interest in lakescaping is growing, said Herbert, with major public projects recently completed at Milford’s Kensington Metropark and Cadillac’s Lakefront Park. A major project at Grose Park in Chester Township will be installed in July. Herbert also runs workshops through the Michigan Natural Shoreline Partnership to train contractors in lakescaping techniques. One of those contractors is Ron Niewoonder of Kalamazoo. He said his landscaping business, E. Niewoonder and Sons, is seeing interest from customers. His company is working on two lakescaping projects on Indian Lake in Vicksburg and West Lake in Portage. I am so disappointed that more and more permits are allowed for these cement break walls that resemble MDOT highway dividers to be used on our beautiful Grand Lake in Presque Isle county. Why can’t they just say NO to these ugly eyesores which are of no benefit. Indeed. It sounds like another example of: “Do as I say, not as I do”. I still want to convert my lakefront property to softshore, but how about the DEQ makes sure THEY do the same? Note to Janet: You said – “Very sad that even the State of Michigan is doing this to their own property.” With all due respect and no malice intended, Janet: It’s OUR property – WE all pay for the upkeep. Steel breakwalls are the worst–and the state routinely approves them. How sad. There seems to be no leadership and no common sense coming from the state nowadays. Oh my! When I read this article, I was fired up to call the DEQ and find out why, at Black Lake in Presque Isle County, the STATE has piled up truckloads of rocks on the shoreline to stop wave action and “save” the shoreline! No natural shorelines at Black Lake/Onaway State Park or at the State campgrounds. I spoke to so many people at the state level, it made me dizzy – and no one would help or even barely listen to me. I kept getting shunted to another person, another voice mail, etc. They also have approved permits for horrible shoreline steel breakwalls and concrete walls on Black Lake and the Rainy River. It takes so much energy to just talk to people in government about this, now I know why people just give up on it. Very sad that even the State of Michigan is doing this to their own property.